Screw Money, Give Us Some Time!! Time and money seem to be two things that an entrepreneur can never get enough of. While my personal favorite of the two is money, I’m coming to realize that time can be just as valuable when there’s a TON to do but only a few people to do it! Sometimes, I wish I could be like Patrick from Spongebob, with nothing to do! In between creating pitch desks, working through financial projections, developing our website, deciding on a business model….dude, Shawn and I are so busy, we don’t even know how to finish this sentence. I definitely have some prioritization to do! Less TV watching and procrastination, and more strategic planning! To all of the entrepreneurs out there: Shawn and I are sorta new at this and would love some advice! How do you fit it all in? How do you find your most productive times? Let us know in the comments. I think everyone needs more hours in the day, if anything just for sleep! 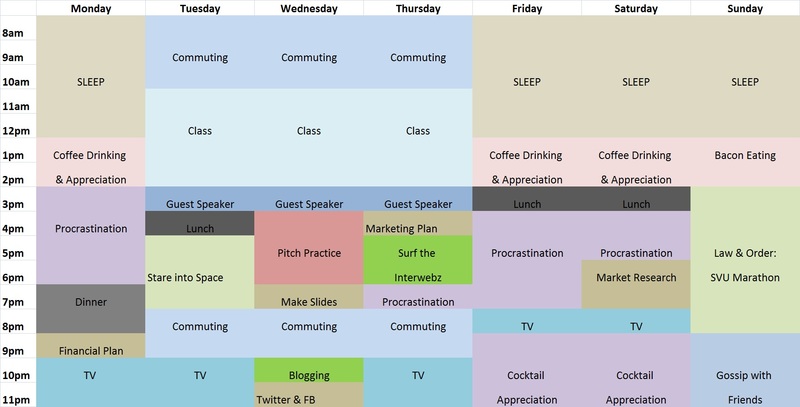 Interesting idea to create a document that outlines what you do every hour of every day- I would do it, but I’m scared of actually documenting the amount of time I spend procrastinating/surfing the interwebz. One thing we both have in common is the L&O: SVU Marathon! As long as you don’t feel stressed ALL the time (just you know, half the time), I think that your schedule works great- prioritize based on where you are week to week!